Today I will share my Best of Eye Products. I'm not really into eye makeup like eyeshadow or eyeliner. I am more of a brows and mascara kind of gal. 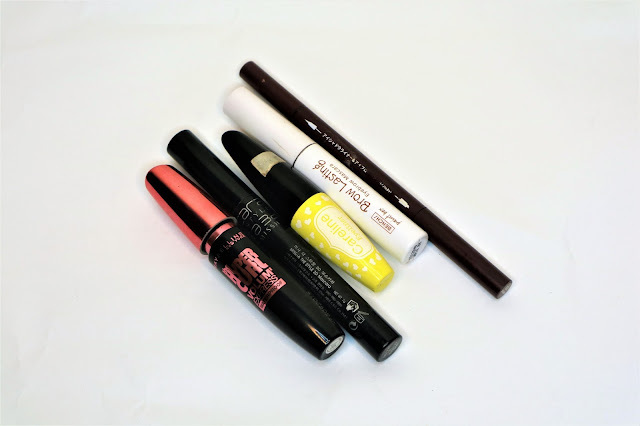 I enjoy buying and testing different brow products as well as good mascara. I can't go out of the house without doing my brows and for everyday look I use only five products maximum. 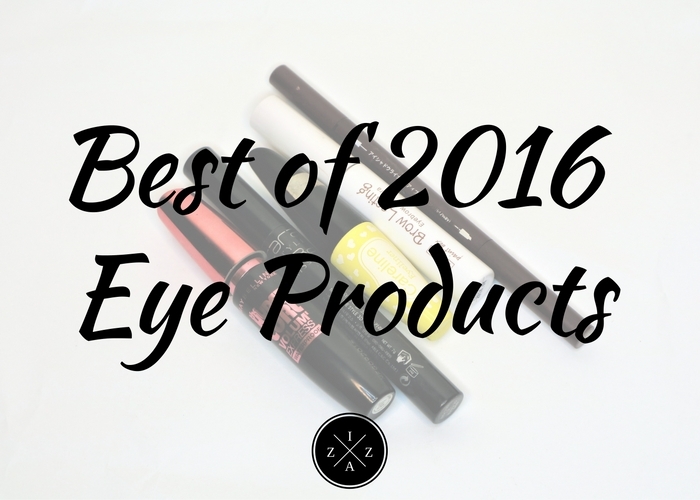 2016 is full of discovery and I love the eye products I've bought and collected this year. Here are my top picks. Have you visited Miniso? They have a branch in Robinsons Manila and I went there with Nica last July. Miniso is like Daiso Japan Surplus store but with higher quality products. They have assorted of products from kitchenware, accessories to beauty products. This Miniso Eyeliner and Eyebrow Pen in Brown is one of the makeup items I picked up at Miniso and enjoyed using for the past six months. This became part of my September Monthly Favorites and My Five Product Face. I love how it is dual ended. You can get a brown eyeliner pen for natural looking winged liners and a brown eyebrow pencil to tame the brows. This is another must have item for Pinay kikay kit. If you like a waterproof brow product that will stay even if you sweat or swim then this Bench Paintbox Brow Lasting in Dark Brown is the one. I used this during my Caramoan Trip and the other bloggers with me were commending how my brows stay in place all day. Before using this I've been doing a brow routine that can take 3-5 minutes to do. This however made it possible for me to do my brows in less than 2 minutes. This also became one of my favorite eye makeup. I enjoy using this to tone down and set my brows in place. The ball-ended tamer works well for me. It stays long but unlike the longevity Bench Paintbox Brow Lasting in Dark Brown offers. Still hands down to this product because it is very easy to use. READ HERE for the review. In the middle of 2016 I overused and abused this Maybelline Color Show Brow Palette. I have a detailed post on How I Do My Brows you can read. I love using the wax to outline the shape that I want and filling up the rest with the darkest brown color. Aside from the brows you can also use this to contour the nose and even to warm up the crease area. Funny how I got this as a freebie on my first Althea Beauty Box and got the same item again on my CHARIS Welcome Gift Box. So for 2016 I got two Missha 4D Mascara. I ain't complaining though because this worked well for me too. This gives length to the lashes that isn't overpowering. If you hate clumpy looking lashes then this product will work well for you. What I do is take my time in building the mascara. I don't need to curl my lashes anymore with this one. It is also easy to apply on the bottom lashes. This local eyeliner is also on my list of amazing finds this year. I love that it has hard tip applicator because it makes creating winged eyeliner easier. Careline Eyeliner dries fast and is smudge-proof too. This product made me fall in love with cat-eye once again. I also didn't experience hard time removing the eyeliner. Any regular makeup remover will do. READ HERE. I know I have included this product in last year's Best of Eye Products but I got a new one earlier this 2016 and it deserves another spot. This is the ultimate mascara for clumpy anime like eyes. I get compliments whenever I use this mascara. Even if I only use this on my top lashes it still looks good. It lasts long and doesn't make me look like a panda after a long day. Worth the hype. That concludes my 2016 Best of Eye Products. You can also read my 2016 Best of Skincare and 2016 Best of Face Products. To read last year's top picks CLICK HERE.